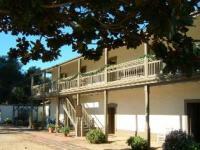 Raymundo Olivas, recipient of a land-grant rancho from Mexican governor Juan Alvarado, built the Olivas Adobe. Once a social hub of the Santa Clara River Valley, the restored two-story main house has its own chapel, a display of Olivas family photographs in the parlor, and period furnishings in the other rooms. Weddings are often held on the grounds, which include a garden of 100-year-old fuchsia and a grape arbor dating from the early California mission period.